Looks like new wireless options will be available for those on the East Coast, as Eastlink will launch its 4G LTE network on Friday, reports the Globe and Mail. The company, a subsidiary of Bragg Communications, purchased $200 million dollars worth of wireless spectrum in 2008. It is set to compete against the big three incumbents, who continue to aggressively invest and expand networks in the region. One advantage Eastlink has over newer wireless entrants is the fact its network will have 4G LTE to enable customers a larger and wider selection of smartphones. Their initial line up will include the Sony Xperia T, Samsung Galaxy S III, LG Nexus 4, and the BlackBerry Bold/Curve (Z10 and Q10 coming next month). The iPhone will not be offered. Eastlink plans to lure customers to its wireless network through bundles, where existing customers will get discounts for subscribing to multiple services; Bell currently uses a similar strategy in the region. Retail expansion is planned at 6 to 9 new locations in the next year and half. Eastlink stores in Nova Scotia and PEI will start to roll out wireless products over the next couple weeks, but customers in Halifax can sign up on the network during Friday’s launch. 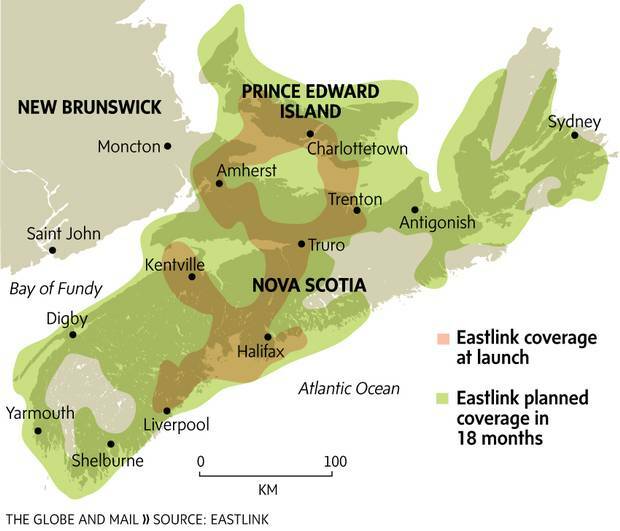 Eastlink has continued to expand its services for customers as of late. In December, Eastlink released their To Go iOS app to allow customers to stream live TV from their iPhone or iPad, powered in part by the the company’s partnership with Cisco Canada. Update: For a detail list of plans and handset pricing, MobileSyrup has obtained them.